Maximilian I, Holy Roman emperor, son of the emperor Frederick III and Leonora, daughter of Edward, King of Portugal, was born at Vienna Neustadt on the 22nd of March 1459. On the 18th of August 1477, by his marriage at Ghent to Mary, who had just inherited Burgundy and the Netherlands from her father Charles the Bold, Duke of Burgundy, he effected a union of great importance in the history of the house of Habsburg. He at once undertook the defense of his wife's dominions from an attack by Louis XI, king of France, and defeated the French forces at Guinegatte, the modern Enguinegatte, on the 7th of August 1479. But Maximilian was regarded with suspicion by the states of Netherlands, and after suppressing a rising in Gelderland his position was further weakened by the death of his wife on the 27th of March 1482. He claimed to be recognized as guardian of his young son Philip and as regent of the Netherlands, but some of the states refused to agree to his demands and disorder was general. Maximilian was compelled to assent to the treaty of Arras in 1482 between the states of the Netherlands and Louis XI. This treaty provided that Maximilian's daughter Margaret of Austria should marry Charles, the dauphin of France, and have for her dowry Artois and Franche-Comté, two of the provinces in dispute, while the claim of Louis on the Duchy of Burgundy was tacitly admitted. Maximilian did not, however, abandon the struggle in the Netherlands. Having crushed a rebellion at Utrecht, he compelled the burghers of Ghent to restore Philip to him in 1485, and returning to Germany was chosen king of the Romans, or German king, at Frankfurt on the 16th of February 1486, and crowned at Aix-la-Chapelle on the 9th of the following April. Again in the Netherlands, he made a treaty with Francis II, Duke of Brittany, whose independence was threatened by the French regent, Anne of Beaujeu, and the struggle with France was soon renewed. This war was very unpopular with the trading cities of the Netherlands, and early in 1488 Maximilian, having entered Bruges, was detained there as a prisoner for nearly three months, and only set at liberty on the approach of his father with a large force. On his release he had promised he would maintain the treaty of Arras and withdraw from the Netherlands; but he delayed his departure for nearly a year and took part in a punitive campaign against his captors and their allies. On his return to Germany he made peace with France at Frankfurt in July 1489, and in October several of the states of the Netherlands recognized him as their ruler and as guardian of his son. In March 1490 the county of Tirol was added to his possessions through the abdication of his kinsman, Count Sigismund, and this district soon became his favorite residence. Meanwhile the king had formed an alliance with King Henry VII of England, and King Ferdinand II of Aragon, to defend the possessions of the duchess Anne, daughter and successor of Francis, Duke of Brittany. Early in 1490 he took a further step and was betrothed to the duchess, and later in the same year the marriage was celebrated by proxy; but Brittany was still occupied by French troops, and Maximilian was unable to go to the assistance of his bride. The sequel was startling. In December 1491 Anne was married to Charles VIII, King of France, and Maximilian's daughter Margaret, who had resided in France since her betrothal, was sent back to her father. The inaction of Maximilian at this time is explained by the condition of affairs in Hungary, where the death of king Matthias Corvinus had brought about a struggle for this throne. 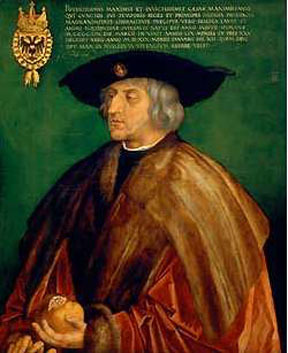 The Roman king, who was an unsuccessful candidate, took up arms, drove the Hungarians from Austria, and regained Vienna, which had been in the possession of Matthias since 1485; but he was compelled by want of money to retreat, and on the 7th of November 1491 signed the treaty of Pressburg with Ladislaus, King of Bohemia, who had obtained the Hungarian throne. By this treaty it was agreed that Maximilian should succeed to the crown in case Ladislaus left no legitimate male issue. Having defeated the invading Turks at Villach in 1492, the king was eager to take revenge upon the king of France; but the states of the Netherlands would afford him no assistance. The German diet was indifferent, and in May 1493 he agreed to the peace of Senlis and regained Artois and Franche-Comté. In August 1493 the death of the emperor left Maximilian sole ruler of Germany and head of the house of Habsburg; and on the 16th of March 1494 he married at Innsbruck Bianca Maria Sforza, daughter of Galeazzo Sforza, Duke of Milan (d. 1476). At this time Bianca's uncle, Ludovico Sforza, was invested with the Duchy of Milan in return for the substantial dowry which his niece brought to the king. Maximilian harbored the idea of driving the Turks from Europe; but his appeal to all Christian sovereigns was ineffectual. In 1494 he was again in the Netherlands, where he led an expedition against the rebels of Gelderland, assisted Perkin Warbeck to make a descent upon England, and formally handed over the government of the Low Countries to Philip. His attention was next turned to Italy, and, alarmed at the progress of Charles VIII in the peninsula, he signed the league of Venice in March 1495, and about the same time arranged a marriage between his son Philip and Joanna, daughter of Ferdinand and Queen Isabella, king and queen of Castile and Aragon. The need for help to prosecute the war in Italy caused the king to call the diet to Worms in March 1495, when he urged the necessity of checking the progress of Charles. As during his father's lifetime Maximilian had favored the reforming party among the princes, proposals for the better government of the empire were brought forward at Worms as a necessary preliminary to financial and military support. Some reforms were adopted, the public peace was proclaimed without any limitation of time and a general tax was levied. The three succeeding years were mainly occupied with quarrels with the diet, with two invasions of France, and a war in Gelderland against Charles, count of Egmont, who claimed that duchy, and was supported by French troops. The reforms of 1495 were rendered abortive by the refusal of Maximilian to attend the diets or to take any part in the working of the new constitution, and in 1497 he strengthened his own authority by establishing an Aulic Council (Reichshofrath), which he declared was competent to deal with all business of the empire, and about the same time set up a court to centralize the financial administration of Germany. In February 1499 the king became involved in a war with the Swiss, who had refused to pay the imperial taxes or to furnish a contribution for the Italian expedition. Aided by France they defeated the German troops, and the peace of Basel in September 1499 recognized them as virtually independent of the empire. About this time Maximilian's ally, Ludovico of Milan, was taken prisoner by Louis XII, King of France, and Maximilian was again compelled to ask the diet for help. An elaborate scheme for raising an army was agreed to, and in return a council of regency (Reichsregiment) was established, which amounted, in the words of a Venetian envoy, to a deposition of the king. The relations were now very strained between the reforming princes and Maximilian, who, unable to raise an army, refused to attend the meetings of the council at Nuremberg, while both parties treated for peace with France. The hostility of the king rendered the council impotent. He was successful in winning the support of many of the younger princes, and in establishing a new court of justice, the members of which were named by himself. The negotiations with France ended in the treaty of Blois, signed in September 1504, when Maximilian's grandson Charles was betrothed to Claude, daughter of Louis XII, and Louis, invested with the Duchy of Milan, agreed to aid the king of the Romans to secure the imperial crown. A succession difficulty in Bavaria-Landshut was only decided after Maximilian had taken up arms and narrowly escaped with his life at Regensburg. In the settlement of this question, made in 1505, he secured a considerable increase of territory, and when the king met the diet at Cologne in 1505 he was at the height of his power. His enemies at home were crushed, and their leader, Berthold, elector of Mainz, was dead; while the outlook abroad was more favorable than it had been since his accession. It is at this period that Leopold von Ranke believes Maximilian to have entertained the idea of a universal monarchy; but whatever hopes he may have had were shattered by the death of his son Philip and the rupture of the treaty of Blois. The diet of Cologne discussed the question of reform in a halting fashion, but afforded the king supplies for an expedition into Hungary, to aid his ally Ladislaus, and to uphold his own influence in the East. Having established his daughter Margaret as regent for Charles in the Netherlands, Maximilian met the diet at Constance in 1507, when the imperial chamber (Reichskammergericht) was revised and took a more permanent form, and help was granted for an expedition to Italy. The king set out for Rome to secure his coronation, but Venice refused to let him pass through her territories; and at Trant, on the 4th of February 1508, he took the important step of assuming the title of Roman Emperor Elect, to which he soon received the assent of Pope Julius II. He attacked the Venetians, but finding the war unpopular with the trading cities of southern Germany, made a truce with the republic for three years. The treaty of Blois had contained a secret article providing for an attack on Venice, and this ripened into the league of Cambray, which was joined by the emperor in December 1509. He soon took the field, but after his failure to capture Padua the league broke up; and his sole ally, the French king, joined him in calling a general council at Pisa to discuss the question of Church reform. A breach with Pope Julius followed, and at this time Maximilian appears to have entertained, perhaps quite seriously, the idea of seating himself in the chair of St. Peter. After a period of vacillation he deserted Louis and joined the Holy League, which had been formed to expel the French from Italy; but unable to raise troops, he served with the English forces as a volunteer and shared in the victory gained over the French at the battle of the Spurs near Thérouanne on the 16th of August 1513. In 1500 the diet had divided Germany into six circles, for the maintenance of peace, to which the emperor at the diet of Cologne in 1512 added four others. Having made an alliance with Christian II, King of Denmark, and interfered to protect the Teutonic Order against Sigismund I, King of Poland, Maximilian was again in Italy early in 1516 fighting the French who had overrun Milan. His want of success compelled him on the 4th of December 1516 to sign the treaty of Brussels, which left Milan in the hands of the French king while Verona was soon afterwards transferred to Venice. He attempted in vain to secure the election of his grandson Charles as king of the Romans, and in spite of increasing infirmity was eager to lead the imperial troops against the Turks. At the diet of Augsburg in 1518 the emperor heard warnings of the Reformation in the shape of complaints against papal exactions, and a repetition of the complaints preferred at the diet of Mainz in 1517 about the administration of Germany. Leaving the diet he travelled to Wels in Upper Austria, where he died on the 12th of January 1519. He was buried in the church of St. George in Vienna Neustadt, and a superb monument, which may still be seen, was raised to his memory at Innsbruck. Maximilian had many excellent personal qualities. He was not handsome, but of a robust and well-proportioned frame. Simple in his habits, conciliatory in his bearing, and catholic in his tastes he enjoyed great popularity and rarely made a personal enemy. He was a skilled knight and a daring huntsman, and although not a great general, was intrepid on the field of battle. His mental interests were extensive. He knew something of six languages and could discuss art, music, literature or theology. He reorganized the university of Vienna and encouraged the development of the universities of Ingolstadt and Freiburg. He was the friend and patron of scholars, caused manuscripts to be copied and medieval poems to be collected. He was the author of military reforms, which included the establishment of standing troops, called Landsnechte, the improvement of artillery by making cannon portable, and some changes in the equipment of the cavalry. He was continually devising plans for the better government of Austria, and although they ended in failure, he established the unity of the Austrian dominions. Maximilian has been called the second founder of the house of Habsburg, and certainly by bringing about marriages between Charles and Joanna and between his grandson Ferdinand and Anna, daughter of Ladislaus, King of Hungary and Bohemia, he paved the way for the vast empire of Charles V and of the influence of the Habsburgs in eastern Europe. But he had many qualities less desirable. He was reckless and unstable, resorting often to lying and deceit, and never pausing to count he cost of an enterprise or troubling to adapt means to ends. For absurd and impracticable schemes in Italy and elsewhere he neglected Germany, and sought to involve its princes in wars undertaken solely for private aggrandizement or personal jealousy. Ignoring his responsibilities as ruler of Germany, he only considered the question of its government when in need of money and support from the princes. As the "last of the knights" he could not see that the old order of society was passing away and a new order arising, while he was fascinated by the glitter of the medieval empire and spent the better part of his life in vague schemes for its revival. As "a gifted amateur in politics" he increased the disorder of Germany and Italy and exposed himself and the empire to the jeers of Europe. Maximilian was also a writer of books, and his writings display his inordinate vanity. His Geheimes Jagdbuch, containing about 2500 words, is a treatise purporting to teach his grandsons the art of hunting. He inspired the production of The Dangers and Adventures of the Famous Hero and Knight Sir Teuerdank, an allegorical poem describing his adventures on his journey to marry Mary of Burgundy. The emperor's share in the work is not clear, but it seems certain that the general scheme and many of the incidents are due to him. It was first published at Nuremberg by Melchior Pfintzing in 1517, and was adorned with woodcuts by Hans Leonhard Schäufelein. The Weisskunig was long regarded as the work of the emperor's secretary, Marx Treitzsaurwein, but it is now believed that the greater part of the book at least is the work of the emperor himself. It is an unfinished autobiography containing an account of the achievements of Maximilian, who is called "the young white king." It was first published at Vienna in 1775. He also is responsible for Freydal, an allegorical account of the tournaments in which he took part during his wooing of Mary of Burgundy; Ehrenpforten, Triumphwagen and Der weisen könige Stammbaum, books concerning his own history and that of the house of Habsburg, and works on various subjects, as Das Stahlbuch, Die Baumeisterei and Die Gärtnerei. These works are all profusely illustrated, some by Albrecht Dürer, and in the preparation of the woodcuts Maximilian himself took the liveliest interest.